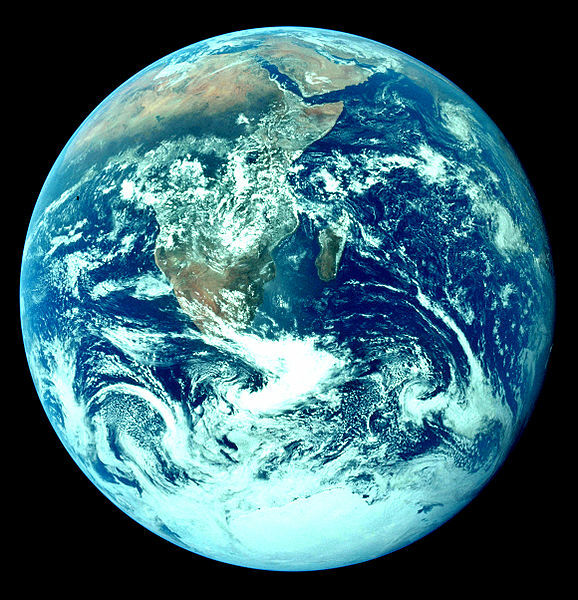 Call to mind “The Blue Marble”, a portrait of the Earth taken from space by the crew of Apollo 17. The living planet Earth is pictured suspended against the infinite void of deep space. As you hold that image, in real time at some future date you might be able to see the oily stain erupt from the devastating accident on the Deepwater Horizon and spread into the azure waters of the Gulf of Mexico, a hemorrhage from the navel of our Mother Earth? It’s not a movie and it’s not a video game. It’s real and it was caused by humankind. It beckons us to break from an exploitive mind set, to resolve once and for all to act with deliberation; to consider the ecological as well as the economic consequences of our actions and to consider not just the urgency of the bottom line on quarterly reports, but the cumulative effect of our actions on successive generations. Then, it beckons us to consider the remedy. The first step is to acknowledge that mistakes have been made. The United States government abdicated responsibility for credible oversight. BP chose to install a single blowout preventer rather than two or more to avoid a single point of failure. Blowout preventers are put through perfunctory testing before going into operation and are put through little or no reliability testing. Another set of mistakes was BP’s repeated miscalculation or misrepresentation of the oil flow rate after the blowout. The determination of how much dispersant to use requires accurate accounting of the flow. BP mistakenly used a series of conventional attempts to close down the flow, ignoring the complications of critical depth and very high pressure. While BP engaged in the conventional attempts, a group of MIT alumni collaborated over the Alumni Web on conceptual solutions to the problem. In a few days rather than dozens of days, they arrived at two approaches, one of which was similar to the technique which successfully capped the well. The scope of mistakes made in dealing with this crisis casts doubt on the entire industry’s readiness for deep water drilling. The second step is to consider the damage caused by the oil spill. Cleanup of the Gulf waters and the coast is of the highest priority. The biological and economic damage to the ecosystem and the residents of the coast must be mitigated. This will take years, decades, if we include the psychological damage. Let us focus on the immediate issue of the dispersants and the removal of oil. BP has used two dispersants 10-20 times more toxic than other options. BP used this product because it claimed there was no other dispersant available in the quantity required. Wouldn’t a more responsible approach be to use a lower toxicity dispersant first to the extent it is available? BP has also engaged in a vast experiment to apply dispersants deep underwater, resulting in huge clouds of dispersed crude oil malingering from 50 to more than 650 feet under the ocean surface. This reduces the opportunities for skimming oil from the surface while increasing the likelihood of damage to the deep ocean ecosystem. One likely result is reduction of nutrients that upwell to the surface in certain locations, causing damage to surface ecosystems where fish live. The third step is to create a response to the current crisis by looking at previous occasions when major environmental damage was done. Part of the solution thus proves to be prevention, and part is remedy of the damage. We might look back to the responses to radiation and materials created by nuclear power and nuclear weapons. Both radioactive material and spilled crude are pervasive pollutants that continue to threaten over long periods of time. The steps taken as remedy, beginning at the end of World War II, were to clean up nuclear “spills” in accordance with the best practices of the time. Further, Colin Powell provided useful precedent with his comment “You break it, it’s yours.” This suggests assistance in treatment of injury. We note that there is now an understanding that treatment of injuries includes more than medical treatment of people. It includes flora and fauna in the environment. As well, the precedent offered by the thinking behind the Nuclear Non-Proliferation Treaty of 1970 suggests establishing new worldwide standards for drilling and safety, particularly in deep ocean waters. We now see from the Gulf blowout that the impacts of blowouts can be international and substantial. It is important to reach an international consensus on the necessity of preventive management of an energy resource that can be misused in a very destructive way, or used for peaceful improvement of living conditions worldwide. As much as we would like to maintain local autonomy, we see this as particularly important now because worldwide impacts can be wrought from incidents in developing nations that do not have the will or the means to control the behavior of huge mineral extraction corporations. The fourth step is application of the antidote to the Gulf oil spill. First, stop the behavior that created the crisis. No more deep water drilling until the oil production industry demonstrates it can drill with a high level of safety. The oil reserves will still be there if and when the industry is able to demonstrate it can drill safely. Second, the development and commercialization of dispersants that are at least twenty times less toxic than Corexit. We might humbly suggest a variation on Charlie’s Soap, a commercial product with no toxic chemicals listed on its Materials Safety Data Sheet. Third, the oil production industry must submit to the necessary and improved oversight and regulation of the U.S. and other governments. They need to dedicate some of their unconscionable profits to the development of alternative sources of energy and clean up the devastation they have wrought. Every consumer of petroleum products (that means all of us!) must be part of the antidote. It is urgent that we reduce our reliance on petroleum, even to the point of discomfort. We must rally our scientists and creative thinkers, as the MIT Alumni rose unbidden to work on the current crisis. We must learn to listen to those seeking alternative solutions, to give them support so new ideas can be tested and considered, even if seemingly strange or impossible. The final step is to look to the future. If humanity changes its focus from the economic bottom line to the ecological bottom line and embraces stewardship of the Blue Marble, the Earth Mother, the strength and resilience of our bond will become increasingly apparent. Respect for each other and for all things makes life possible. We pray for those who have lost their lives: people, land and marine animals, fish, insects and plants. We pray for those who have been exposed and are therefore at risk, and for those who have been economically impacted. Let it be so.